Wallflower Global in association with Fingermark of New Zealand installed a series of Wallflower Navigator Kiosks for Westfield New Zealand at their Albany Shopping Mall. This is the largest mall in the country. The challenge was to develop an innovative solution that went beyond existing way finding functionality to include the ability to easily include promotional media and to allow simple adjustments to the display when mall configurations changed. Existing way finding technology normally requires any changes in position of wayfinder kiosks, store details etc. to need expensive revisions of the display and navigation software or media. The Wallflower team felt there was a better way to approach this. Most way finding kiosks rely on graphic artists creating files showing all combinations of possible routes to destinations from each kiosk. The Wallflower Navigator utilises a Flash based display menu to provide the on screen display and touch capability. The mall management staff create and maintain details of the stores, wayfinder kiosk locations, transportation methods such as escalators using the Wallflower Scheduler. A floor plan of the mall is displayed in the Scheduler and staff simply drag the various items such as stores onto the plan. After marking obstacles such as pillars, Wallflower calculates the most effective route from each wayfinder kiosk to all stores and facilities such as toilets. If required alternative routes for disabled visitors are also calculated. Whenever any changes are required such as store names, wayfinder kiosk locations etc. these can be made in a few minutes and the wayfinder kiosks updated immediately. Each wayfinder kiosk displays a Flash based menu and includes powerful search information. When a request is raised Wallflower passes the routing details to the Flash file to display. 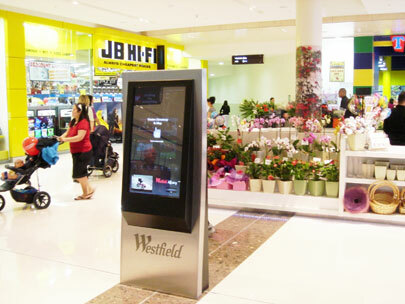 The deployment also provides Mall management with the ability to show promotional media on the screensaver. When a search request is executed media relevant to the search can be shown. Promotions can also be tied to events such as Christmas and also grouped by retail type or individual retailer. For example a search for shoe stores will respond with routing information as well as promotions for all shoe stores. A search for an individual store will show any promotions for that store.